The Sun has launched “Goals”, a commercial promoting the Sun+, the newspaper’s digital entertainment bundle. 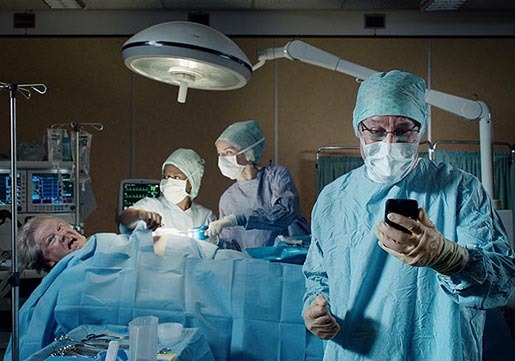 The commercial illustrates all the places users can catch up on Barclays Premier League football highlights, in bed, down at the pub and even during a hospital operation, but warns about potentially hazardous spots to get caught watching. The Sun Goals campaign was developed at Grey London by executive creatie director Nils Leonard, creative director Dave Monk, copywriter Paul Miles, art director Adam Staples, agency producer Jessica Ringshall, junior producer Jennifer Gillen, business director Tamsine Foggin, account director Sarah Pang, senior planner Matt Gladstone, planner Hamish Cameron, working with News UK director of marketing communications Nick Stringer and head of marketing Rossa Shanks. Filming was shot by director James Haworth at The Sweet Shop with director of photography Federico Alfonzo and producer James Edmund White. Editor was Adam Spivey at The Play Room. Music was produced at Grand Central.